we gotta do that again!!! I was introduced to Wicked Lures over 3 years ago through a guide friend of mine that said you need to try these for the fall salmon fishery. We had been fishing all morning and it was slow and so I decided to tie on pink/chartreuse Wicked and on the first cast my client hooked up. We proceeded to catch salmon after salmon and I was a believer. James Beasley has literally change the playing field when it comes to spinner fishing. Since that day I have thrown everything out of my tackle box and Wickeds are my go to lure. James you have created one killer product thank you! 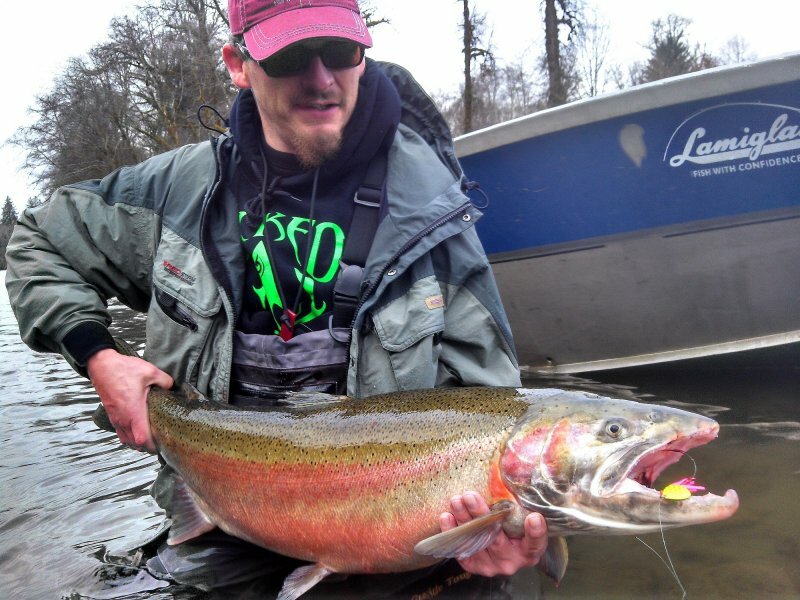 When most people see a wicked lure they instantly think, oh Coho fishing. This is because of the hoochie. I have never fished with a lure that has caught such a wide variety of fish. I can go out to my local river catch a spring chinook on a pink and chartreuse wicked then go up to my local ponds and catch a bass on the same thing. 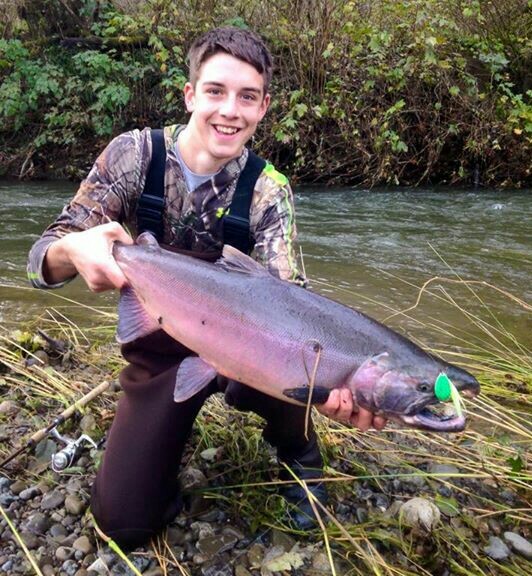 Anything from summer or winter run steelhead, bass, pike or any species of salmon in the salt or freshwater. It doesn’t matter, wicked lures do the trick. This is because the inventor of wicked lures, James has put many hours or sweat, blood and tears building this lure. Whether he’s prototyping new color combinations or making deals with manufactures to make his lure better and more reliable. This guy will stay up till 2 in the morning just to make a video for you to show you how to set up his product, that’s a guy that I like to buying lures from. I met James 2-3 summers ago. He convinced me to start using them, so I did. The year I started using wickeds on each fishing trip I went out it increased the amount of fish I caught greatly. 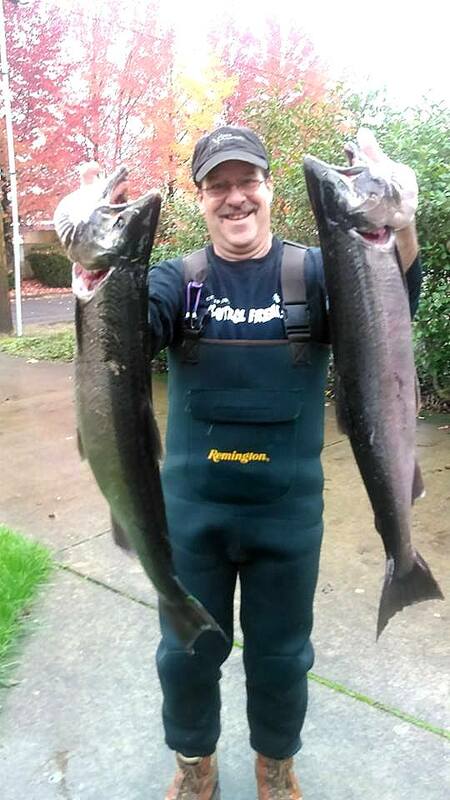 I went from catching 1 steelhead in the winter to 25 this year, 1 springer a year to 6 and 1 being 30 lbs. 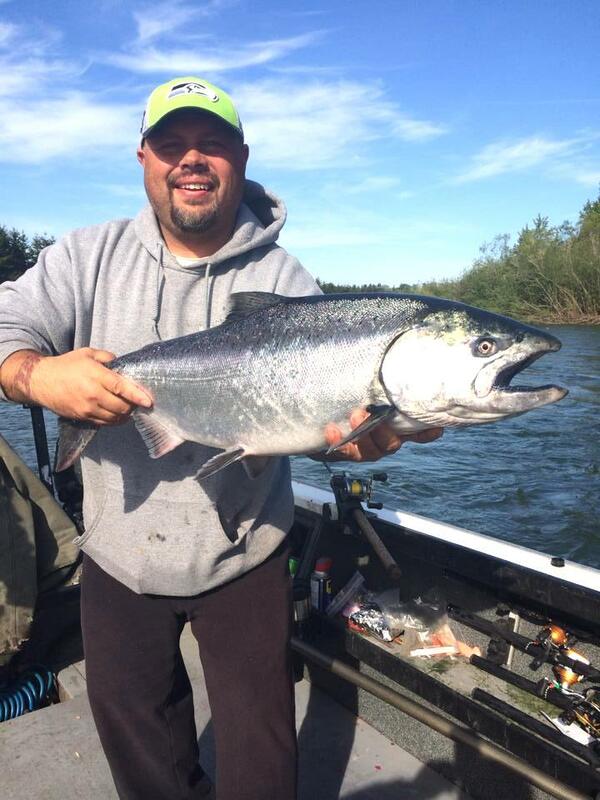 30-50 Coho a year to over 250. 1 day during Coho season I caught 30 Coho in a matter or 5-6 hrs. I haven’t heard of any other lure doing that. This lure is and always will be the lure that I go to when I’m fishing, no matter what it is. So go to your local fishing store or to wickedlures.com to get the lure that might catch you a fish of a lifetime! I have fished for years in the ocean always catching fish, but have always struggled in the rivers. Then I found Wicked Lures. My wife hasn’t caught a salmon or steel head in the rivers. We tried them out on the Wilson River during a period of low water. Our first cast, we immediately hooked into fish and that continued all day. Now we are both hooked on Wicked Lures. Best of all, my wife loves to go river fishing with me now that we actually catch fish. Needless to say, we were sold on Wicked Lures with our first cast. We can always rely on Wicked Lures. They save us time & money because we don’t have to constantly struggle with rigging up different hardware & configurations. You take them out of the package and they are ready to go. I would recommend them to any one that fish the rivers. We plan on using them all summer because we know we will fill our tags. We can’t wait to try them out in the ocean.